Today we sadly learned that another local deli in Thousand Oaks closed its doors. But the good news is that a brand new restaurant is coming soon to The Lakes!!! Something completely different! Umami Burger is coming to The Lakes! Umami (I think it is pronounced "Eww Mommy") according to their website "is a Japanese word describing the pleasant and savory taste imparted by glutamate, a type of amino acid, and ribonucleotides that occur naturally in foods. Umami as a taste is subtle but it blends with other tastes well to expand your experience while eating." 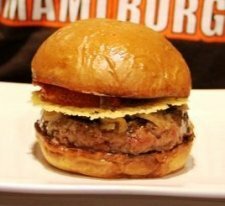 While eating glutamate and ribonucleotides doesn't sound particularly appetizing, this Umami Burger has received rave reviews, including this December 2010 "Burger of the Year" article in GQ Magazine. In that article, the author notes the savory umami sauce is the "fifth taste," after the basics of sweet, sour, bitter and salty. Obviously I have not eaten a Umami Burger but I'm looking forward to trying one! Currently Umami Burger has locations in Hermosa Beach, Los Angeles, Santa Monica, La Brea, Los Feliz, Studio City and San Francisco. Welcome to Ventura County, Umami Burger! Check out the menu and you will find some interesting items, including a dozen or so Japanese inspired burgers, side dishes and draft beer. I see a truffle burger with truffle cheese and truffle glaze. OK my mouth is watering now. I also see turkey, ahi tuna and veggie burger options on the menu for those not inclined to eat red meat. Check out the Studio City menu here. Giada De Laurentiis, of Food Network's The Best Thing I Ever Ate, likes Umami Burger in Hollywood for their unique burger combinations. Heck, I'll eat anything Giada tells me to eat!! No information on opening date at this time. Read more about Umami Burger at www.umamiburger.com.